Epic Games’ Fortnite is a popular third-person shooter-survival game that pits up to four players who work together to fight off zombie-like creatures and defend objects by building fortifications. Players can choose a myriad of guns to do battle with, including an excellent double-barrel shotgun that can dispatch enemies rather quickly. 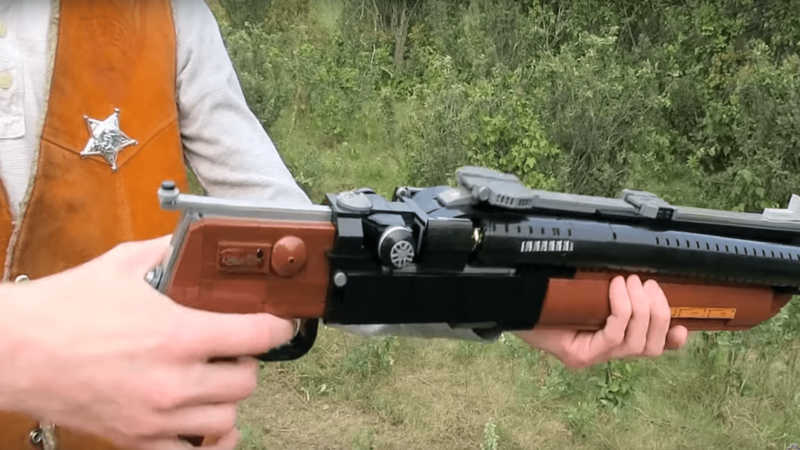 Being a favorite of some players, the creative minds from ZaziNombies decided to recreate the shotgun using LEGO bricks and a bit of ingenuity. The double-barrel break-action shotgun is decked-out with a tactical pistol grip along with some wooden-looking furniture and weighs about 4-pounds. The shotgun was designed using approximately 1100 LEGO bricks along with a LEGO Technics’ hinge-pin that gives the gun a realistic reload action by snapping the barrel down as you would with a real shotgun. ZaziNombies even created realistic-looking red and gold shotgun shells that fit nicely into both barrels. The Lego double-barrel shotgun broken down into its basic building blocks. The tricky part of the build was trying to get the barrel placement just right and connected to the center structure, which was done using bent hinge pins. The pistol grip was constructed using inverted brown-slope LEGO bricks with two different shades to give the weapon a more realistic look. The double-barrel shotgun was recently added to the game with the recent 5.2 patch and can take two enemies (without shields)- one for each barrel. It can also be upgraded in-game, transforming it into the “Thunderbolt shotgun,” which can target multiple enemies in a wide cone in front of the player. Beyond the shotgun, the ZaziNombies also recreated Fortnite’s Dual Pistols, Chug Jug, SCAR rifle, and Heavy Shotgun, as well as a ton of other game-related weapons, which are all featured on their YouTube channel.